First Lines: ' "You should leave. Now." My father's growl of warning resonated in some dark, primal part of me, and suddenly I craved torn flesh and fresh blood glistening in the moonlight. This is one of the best Shifter series I've ever read. I wouldn't have found any of Rachel Vincent's books if I hadn't been shopping at Target and come across the cover of Stray sitting out of place in the Thriller section. The cover won me over instantly, and although at the time I was reading mostly crime and mystery books, Stray was the one that pushed me into the Fantasy genre. Thank you! Shift picks up immediately after the end of Prey where the Sanders Pride is preparing to go into battle after the unjustified death of Ethan. Alliances are being made and Calvin Malone is fighting for power bringing down whoever he feels necessary to get the job done. If you thought things were bad, well they get worse. Thunderbirds, who can shift faster than any werecat alive, begin attacking the Sander's Pride. The number of casualties are rising, and any hopes of winning the battle with Calvin Malone are falling fast. Then young tabby Kaci is kidnapped and the race is on to find the answers in order to have Kaci released and all the pressure is placed on Faythes shoulders. Faythe has grown so much over this series and while the stubborn streak is still there, the realization of how important she is to her pride is sinking in and in turn her decisions are more justified than ever. Can't help but feel for her though. She seems to find trouble even when she's not looking. Her love life is on the verge of being shattered. The love triangle between Marc, Jace and Faythe is intense throughout Shift and Faythe is torn between two men, both she can't bear to lose. 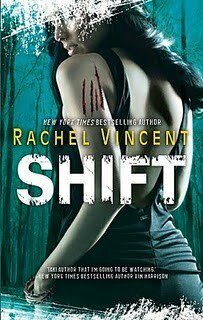 Edgy, action packed and dramatic, Shift is a MUST read. While this can definitely be read on it's own I highly recommend reading the other four Shifter books for maximum impact. Sad to see yet another awesome series coming to a close, this has been one helluva ride and well worth all the hours I've invested in reading. The Last book, Alpha will be out on the 1st of October 2010. This is on my TBR list! Her books sound like a fantastic read and I can't wait to get to them! This whole series is in my TBR Pile cept the last one, of course - I guess maybe since it's so close to the end of the series coming out I might wait...I have heard nothing but amazing things though and I love your reivew!